This is a history of spiritual events in a family. Like many Bible stories, this record should provide lessons of significant spiritual benefit about influence and individual responsibility. Consider some historical background. The United States Constitution was adopted in 1789. Ohio became a state just seventeen years later in 1806. In 1838, the Millcreek Church of Christ began in Union County, Ohio. So these events occurred in the very early years of our nation and of the state of Ohio and in the history of the Lord’s church in this country. In 1847 the Millcreek church built a log meetinghouse. This was replaced in 1860 with a building that is still in use today with significant remodeling. In the cemetery behind the meetinghouse of the Millcreek church are the tombstones of David Sikes Argo and his family. David Sikes Argo was born in Greene County Pennsylvania in 1824. In the early 1840s he moved to Union County, Ohio. In 1845 he married Sarah Henson. In 1846 he became a Christian and was united with the Millcreek church. David Argo had several children, one of whom was Ira Henson Argo, who was born in 1856 and baptized in 1870. In 1900, the Millcreek church divided over instrumental music. Ira Argo and his family stood with those who defended the New Testament pattern of simply singing in worship. Ira also became a gospel preacher. He was known for his long sermons and “fire and brimstone” preaching. Later he moved to Arkansas where he began a local congregation which today is known as the Humphrey Church of Christ and is still listed in several directories of conservative churches of Christ. 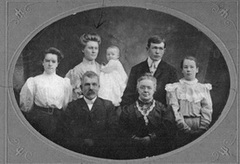 Ira and his wife Jennie had several children, one of whom was a daughter named Esther, born in 1888. Esther became a Christian in 1901. In 1911, Esther married Jesse Pratte, who was also a Christian. They had several children, one of whom was Enos Pratte. Enos was born in the 1916 and also became a Christian. Enos married Elnora DeBruyn in 1941. They had two children, both of them became Christians. One of them was David Pratte, born in 1944. In 1969, David married Karen Sue Shinabarger. They had three children all of whom today are identified with faithful local churches and all of them are married to faithful Christians. David and Karen’s children now have ten children who also are making the commitment to follow Jesus as they reach the age of accountability. Yes, David Sikes Argo was my great, great grandfather. But this is not just a family history. Remember that the Bible often uses events from real people to teach serious spiritual lessons. So, what can we learn from these events? Each Individual Must Make a Personal Choice about Christ. The lesson is not that we should simply follow our family religion. Every individual in every generation that we have mentioned had to make their own decision whether or not to be a disciple of Jesus. No one else could make the decision for them. The fact that others did or did not obey the gospel did not change the responsibility of each individual. And the same is true for you. Regardless of what your parents and ancestors have or have not done in serving Christ, you must make a personal, individual commitment based on your own understanding, faith, and repentance. Ezekiel 18:20 – The son shall not bear the guilt of the father, nor the father bear the guilt of the son. The righteousness of the righteous shall be upon himself, and the wickedness of the wicked shall be upon himself. Many people become what they are religiously simply because of what they learned from their family as they grew up. But the Bible teaches that each individual must make a personal choice about his/her relationship with God. The Choices We Each Make Have Significant Impact on Other People. Although each of us must make a personal decision to serve God, the choice we make affects many other people. Matthew 5:14,16 – You are the light of the world. A city that is set on a hill cannot be hidden. … Let your light so shine before men, that they may see your good works and glorify your Father in heaven. David Argo made a decision in 1846 that has influenced at least six generations of people since. One man’s decision influenced a number of other people to become followers of Christ. Many more have heard the gospel and had the opportunity to obey. Gospel preachers and at least one faithful local church have also resulted. And who knows what influence yet remains in the future? Imagine what might have followed had David Argo refused to obey the gospel. And it is not just the decision whether or not to become a Christian. Other generations have faced major doctrinal issues. Ira Argo faced the division over instrumental music in worship. I remember when my own parents dealt with the issue of church support of institutions and the Social Gospel. Choices you make will likewise affect those around you. How many other people may have the opportunity to become Christians because you serve God faithfully? How many future generations will be influenced for good? And how many will not have that opportunity if you do not become a Christian? And how many will be influenced by the stands you take about the many decisions each of us faces? Will you make the decision to serve the Lord and teach the gospel to those around you?